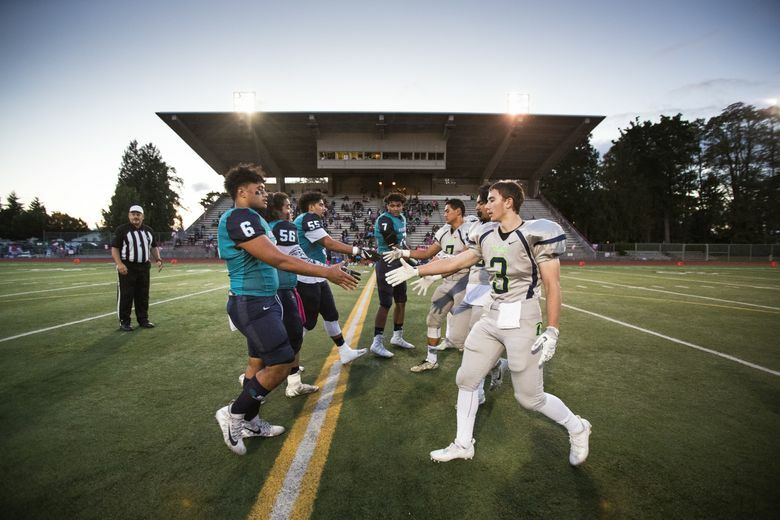 Copying a page from the Metro League playbook, principals for North Puget Sound League 4A schools on Monday approved a proposal to split its 16 football teams into three divisions. The change will begin for the 2018 season. The NPSL, a revamped South Puget Sound League in its second season, was a combined 1-16 in the postseason the past two years. Kentwood was the lone win when it defeated Jackson 44-14 to advance to the regional round of the Class 4A state tournament last fall. The Conquerors (8-3) lost to eventual state runner-up Woodinville 48-7. During the 2016 season, Kentwood and Todd Beamer were undefeated in their respective Cascade and Olympic divisions at 7-0. Neither advanced to the state tournament. The competitive imbalance the teams face within the NPSL may create a false confidence for the best and apathy for the struggling programs, according to Lutes. He counted 38 league games ending in a blowout — a 30 or more point differential — the past two seasons. Under the revised league, Kentwood, Beamer, Auburn Riverside, Kennedy Catholic, Tahoma, and Enumclaw will compete against each other in the top division now known as “Mountain.” The “Valley” will be Auburn Mountainview, Hazen, Auburn, Federal Way, and Kentlake. The third tier is the “Sound” Division comprised of Kent Meridian, Decatur, Thomas Jefferson, Mount Rainier and Kentridge. Unlike the Metro League, adjustments will be made after each season, using the division records as the determining factor for movement. The NPSL also won’t give its top-tier teams a bye week. The six Mountain schools will play a Week 9 game along with the four Valley teams and two from the Sound Division. The Metro League debuted its competitively balanced, three-tiered league last fall. While O’Dea and Eastside Catholic are historically good in football, Garfield and Rainier Beach jumped into the mix this season. Four of the eight teams that advanced to the 2017 Class 3A state tournament quarterfinals were from the Metro League. The state title game was between O’Dea and Rainier Beach, the Fighting Irish winning 38-11. In addition to Metro and NPSL, the 16-member SPSL 2A moved to a three-tired league for sports aside from football. Kingco, which has 17 schools spread across three WIAA classifications, is analyzing how it might benefit from the system, according to Inglemoor athletic director Lance Gatter. While NPSL football coaches and athletic directors want postseason wins, the change is also to maintain interest in football by matching up competition levels better.